Stranded alone on a desert island, he had lived to tell the tale. A triumphant return to the ton saw James Trevenen hailed as Beau Crusoe-a gentleman of spirit, verve and action. But only he knew the true cost of his survival! Susannah Park had been shunned by Society. 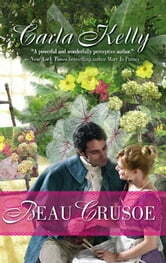 She lived content with her calm existence-until Beau Crusoe determinedly cut up her peace! The beautiful widow wanted to help him heal the wounds of the past-but what secrets was this glorious man hiding?